In order for driverless cars to work, they’ll need to be able to do tackle a bevy of ordinary tasks that motorists perform each day: navigate roadways, stay within a lane, stop for pedestrians who unexpectedly cross their path and successfully pull over for police cruisers or fire trucks needing to speed by. 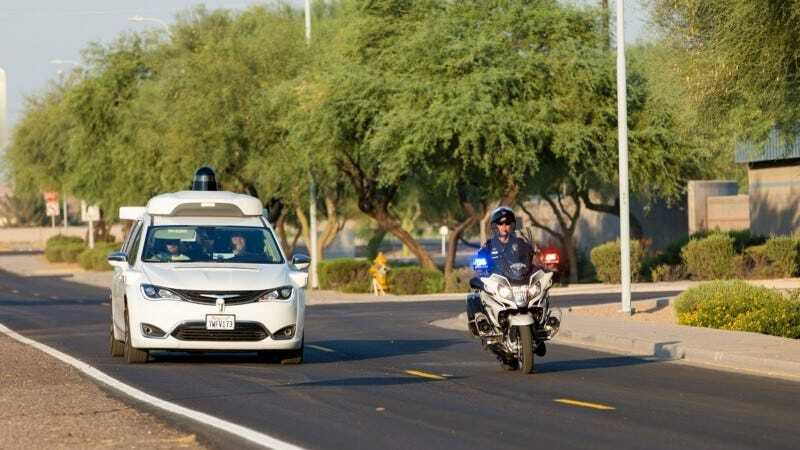 Google, through its self-driving car subsidiary Waymo, has been working on the latter task, and recently teamed up with a local Arizona fire and police department to conduct its “first emergency vehicle testing day” with the company’s fleet of self-driving Chrysler Pacificas. Today, our self-driving minivans are capable of hearing twice as far as they could with our last suite of sensors. And with our new sensors, we’re teaching our software to discern which direction the sirens are likely coming from. Drivers often hear the sirens of an emergency vehicle first, so being able to gauge the direction of an oncoming fire truck or ambulance allows our self-driving vehicles to make smarter and safer decisions. For example, our vehicles may pull over if an emergency vehicle is coming from behind, but yield at an intersection if our sensors detect sirens coming up ahead. The cars come equipped with an audio detection system designed in-house by Waymo. Coupled with a suite of self-driving sensors, the vehicles can “see emergency vehicles and their flashing lights even further and clearer with our custom vision system, radars, and LiDARs,” Waymo said. Waymo’s self-driving car program has caused a stir all year, thanks to the high-profile lawsuit involving Uber, which the Google company accuses of stealing pertinent trade secrets about its autonomous driving effort. At the same time, Waymo has linked up with Uber rival Lyft to work on self-driving cars together, and earlier this year it launched a pilot program for the public to test the autonomous Pacificas in Arizona. And it’s continued to develop its self-driving technology, evident by these recent tests. TechCrunch has a video, which you can check out below, that shows some of the tests in action. I imagine it could be a tricky balancing act to perfect in the early stages, given that self-driving cars will not only have to recognize an emergency vehicle’s coming, but also be aware of manually-controlled cars around it. But this is a neat look into the kind of work that needs to be done to successfully adopt autonomous cars onto public roadways.